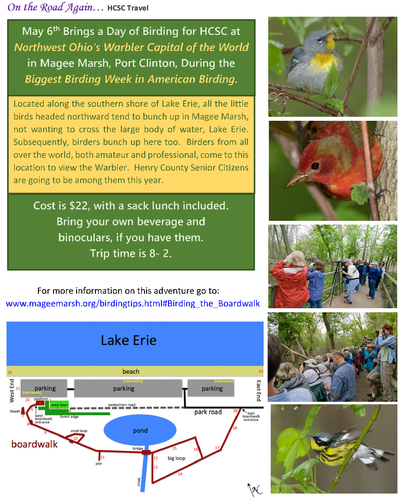 On the Road Again...HCSC Travel is going "Birding at the Warbler Capital of the World" at Magee Marsh in Ottawa County. A sack lunch will be provided. Bring your own drink and binoculars, if you have them. You must register and pay in advance at the Henry County Senior Center. Bus will leave the Henry County Senior Center, 203 Rohrs St, Napoleon, OH 43545, at 8 am. Monday, May 6, 2019. 8am-2pm. Cost is $22 which includes a sack lunch.